Treat yourself to most magical romantic experience set up in a beautiful setting or a venue of your choice. 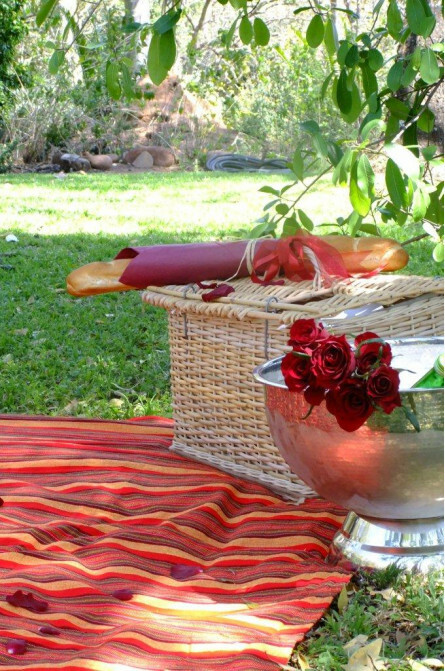 Your basket will be delivered & set up for you at a secluded spot complete with Personalised Basket filled with Delicious Treats, Soft Blanket, Scatter Cushions, Rose Petals, Chocolate Truffles in a Tin Engraved with your names, Soft Drinks on Ice & 20 Long Stem Red Roses. Assortment of Crispy Breads, Smoked Snoek Pate, Feta & herb dip, Roasted Red Pepper Dip, Assortment of Savoury biscuits, Selection of 3 Estate Cheeses, Medley of Home Made Fruit Preserves, Smoked Cape Salmon with Crème Cheese & Capers, Assortment of Cold Meats, Cherry Tomatoes, Butter, Organic Mustard, Yummy Garden Salad, Delicious Dessert, Fresh Seasonal Fruit Skewer , Lindt Chocolate Balls, Two Romantic Cup Cakes, Juice & Mineral Water. Vegetarian options can be arranged. Halaal friendly can be accommodated for. All baskets & accessories are given to you on a loan basis & must be returned. A goods insurance deposit is charged which will be refunded to you on the complete return of our picnic baskets & accessories. 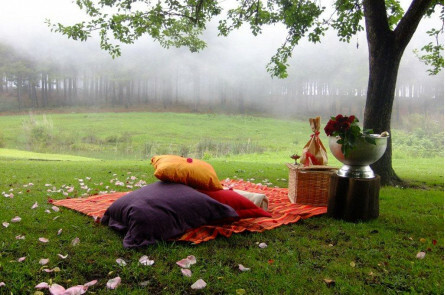 For our Surprise Picnics we use specific venues, if you want to use a different venue there could be an additional travelling fee. 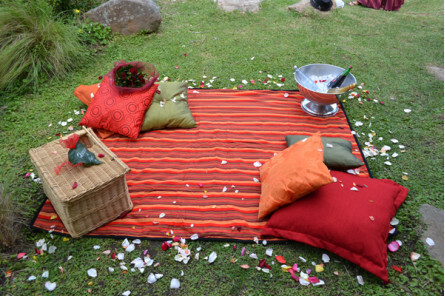 Although we weave magic to bring you the most memorable picnic experiences we cannot control the weather therefore picnics cannot be cancelled on account of the weather. If you really can’t make it? Availability | Available 7 days per week, subject to availability. Who | Suitable for adults only. Numbers | This picnic is suitable for two adults. Weather | Picnics cannot be cancelled due to the weather. Clients are asked to suggest an alternative venue. Duration | Picnic at your leisure - there's no rush! 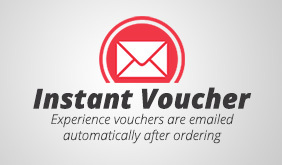 Additional Information | Terms and Conditions Apply.